The Ventura County Child Care Association is a group of dedicated state licensed home based child care providers. 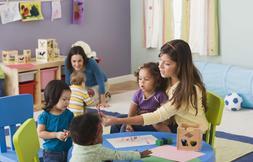 The VCCCA Referral Network is provided for parents seeking licensed child care. The VCCCA does not license, recommend, or endorse any of its members. The VCCCA can not insure the accuracy of provider information or the quality of any childcare provider referred in this process. It is your right and responsibility to check a provider’s references and seek as much information as you can in order to choose childcare that meets your family’s needs. Note: California State Law requires any licensed childcare facility to make accessible to the public a copy of their license and any report that documents a facility visit. In addition you may contact the Department of Social Services, Community Care Licensing Division at 1-844-538-8766 to obtain complete information on any licensed child care facility. You may also find some information online at www.ccld.ca.gov follow the link to "Find Licensed Care." The Ventura County Child Care Association offers the information and links provided on this site as a courtesy to the public and its members. We do not endorse any of the views expressed or implied from any other sites that are linked from this web site. Here are all the cities with members! Feel free to look through near your home, work, and in between! Lots of wonderful providers in our area! Keep in mind you can look in both the city you work in and the city you live in! There are so many different providers all over Ventura County!